Though widely respected as a powerful writer of graphic fiction, Koike has hosted television programs; founded a golf magazine; produced movies; written popular fiction, poetry, and screenplays and mentored some of Japan's best manga talent. Lone Wolf and Cub, created in collaboration with Goseki Kojima, was first serialized in in 1970 (under the title Kozure Okami) in Manga Action magazine and continued its hugely popular run for many years, being collected as the stories were published and reprinted worldwide. 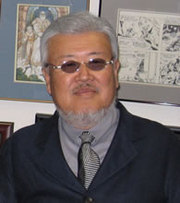 Koike collected numerous awards for his work on the series throughout the next decade. Starting in 1972, Koike adapted the popular manga into a series of six films, The Baby Cart Assassin saga, garnering widespread commercial success and critical acclaim for his screenwriting. Koike and Kojima were dubbed the "golden duo" on the manga world for their many successes. And to give something back to the medium that gave him so much, Koike started the Gekiga Sonjuku, a college course aimed at helping talented writers and artists break into the comic field. Kazuo Koike is currently considered a "single author." If one or more works are by a distinct, homonymous authors, go ahead and split the author. Kazuo Koike is composed of 5 names. You can examine and separate out names.